News Detail - S.O.R.G. S.O.R.G. symposium on 25 Years of Distraction Osteogenesis in CMF Surgery, Paris, France - S.O.R.G. Now it was time to say goodbye to both loyal S.O.R.G. members retiring from their professional career. Chairman Alberto Bianchi (Catania, I) felt much honored to chair this farewell symposium in the city of Paris where Paul Tessier pioneered craniofacial surgery almost 50 years ago. The S.O.R.G. 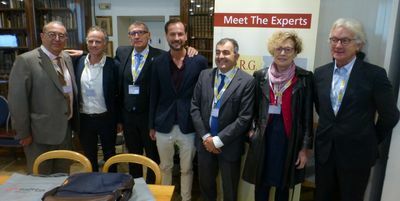 Craniofacial section together with various French and international speakers offered a comprehensive overview on their individual professional expertise on different distraction procedures together with an outlook on future trends. The very atmospheric and historical hall in the “Académie Nationale de Chirurgie” was almost too small to accommodate the 80 participants visiting the event.